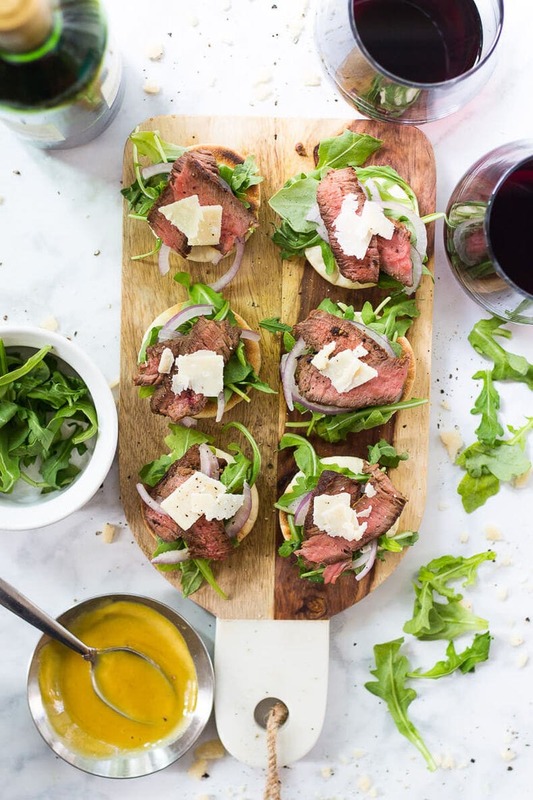 These Steak and Arugula Salad Bites with Parmesan are the ultimate weekend indulgence, and come together with just a few simple ingredients along with a delicious honey dijon sauce. OH HEY THERE WEEKEND. I SEE YOU IN SIGHT! 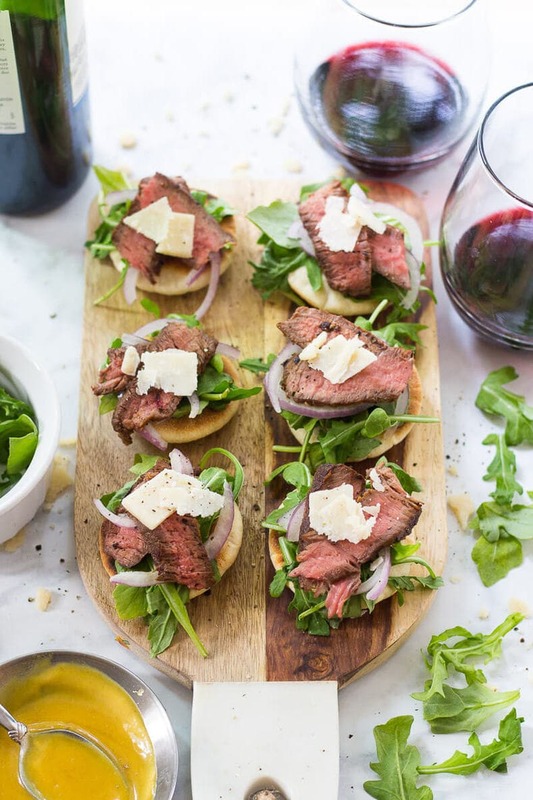 I'm currently welcoming in the most wonderful time of the week with these delish Steak and Arugula Salad Bites. With shaved parmesan of course, because life is always better with cheese. These appetizers are almost cliche because they're so popular in the foodie world. Look guys, I know steak and arugula is such a classic combination. It's been done so many times before. I mean, can you even blame me though? 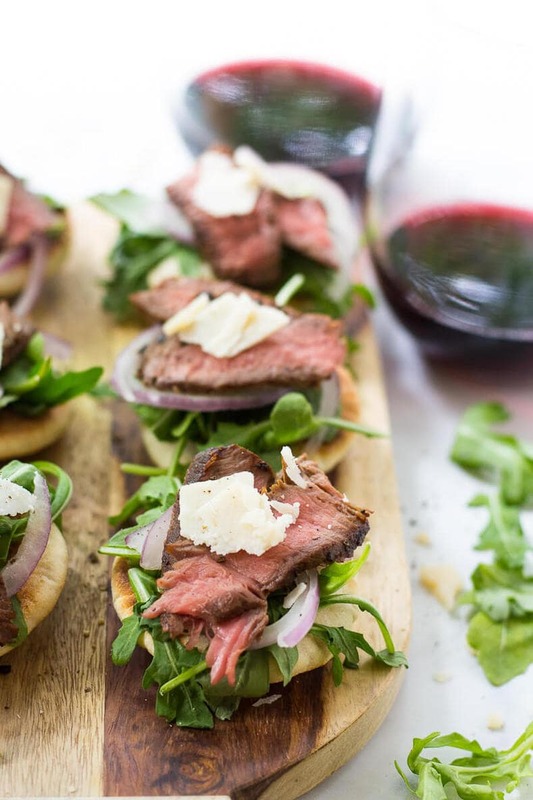 These Steak and Arugula Salad Bites are so delicious, I just HAD to! Now let me tell you about this hell of a week. Speaking of cliches, I've literally had my nose to the grindstone, working away like the world is about to end. Scratch that, if I EVER try to tell you that I would be working away while the world is ending, please feel free to come over and give my head a shake. Anyways, I shot two videos, did five food photoshoots (ONE OF WHICH THE FREAKING RAIN ALMOST RUINED), then I finally got my email newsletter on track and I've also slowly been finding my footing with Snapchat. 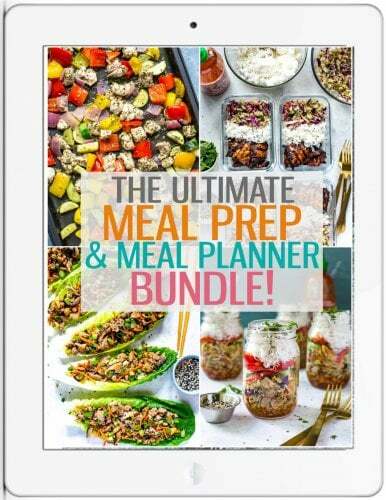 Btw, if you're not already following me (username is thegirlonbloor! 😉 ) then I have to say you're reaaaaaaaally missing out. The main point being in the above little rant, however, is that this girl needs to relax more. Like I need some good food, and some wine, STAT. 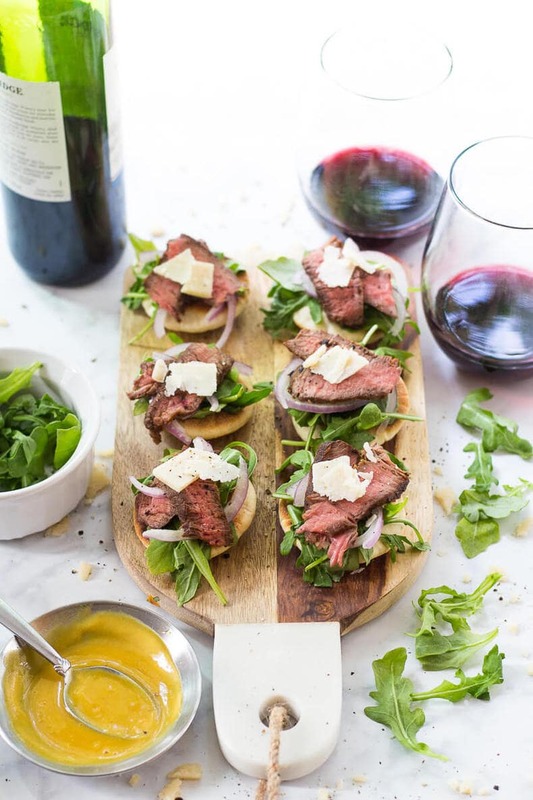 Well people, these Steak and Arugula Salad Bites are just the perfect little app to celebrate all the wonderful magic of summer. Pull up a few Muskoka chairs, sit back and soak in the last of the good weather with these and a good bottle of wine. If I can manage to turn off, I just might join you! For real though, I'm SO happy it's Friday. You know that end of the week, giddy happy feeling you get just knowing that tonight you will get to lounge around freely, or go out until all hours of the night, then sleep in tomorrow or have brunch and just exist in this freeing sense of relaxation? No expectations, just social time and good cheer. 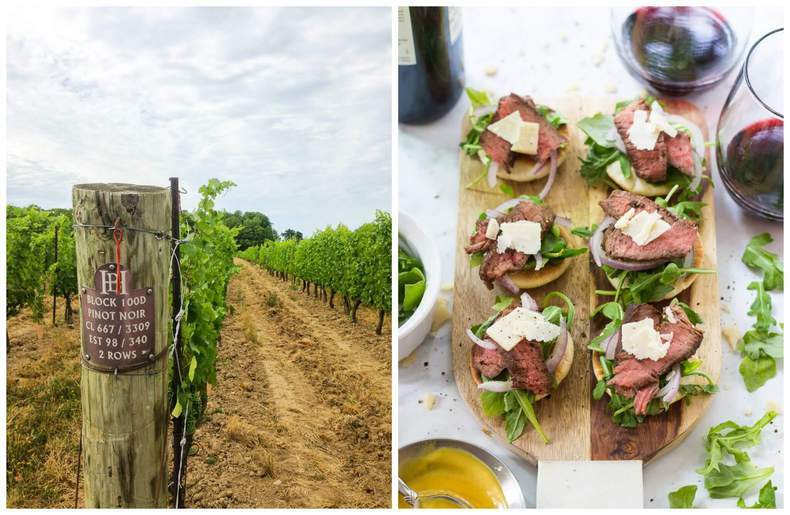 By the way, when I say wine, have I mentioned how extremely lucky I am to be living so close to the Niagara region aka wine country? 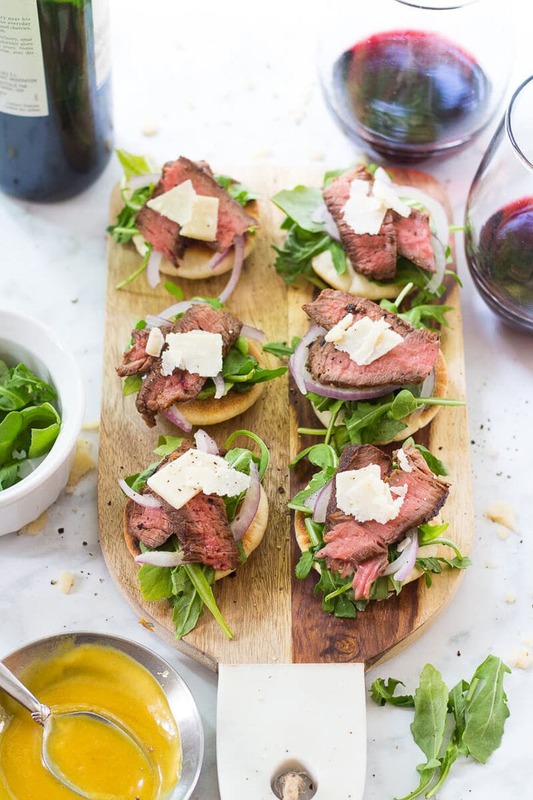 Well, let's take a trip back to the winery together with these delicious Steak and Arugula Salad Bites with Shaved Parmesan. I know you're probably wondering why I used mini pitas here, and honestly, it just makes them that more easy to make. There's no cutting bread, no toasting, no nonsense. Just pure deliciousness in a matter of 20 minutes. I mean, I won't be mad if these are the very last things I eat before this August completely disappears out of our lives this year. Okay, maybe I'll take one more of these Shrimp Stacks too before summer completely clears out. 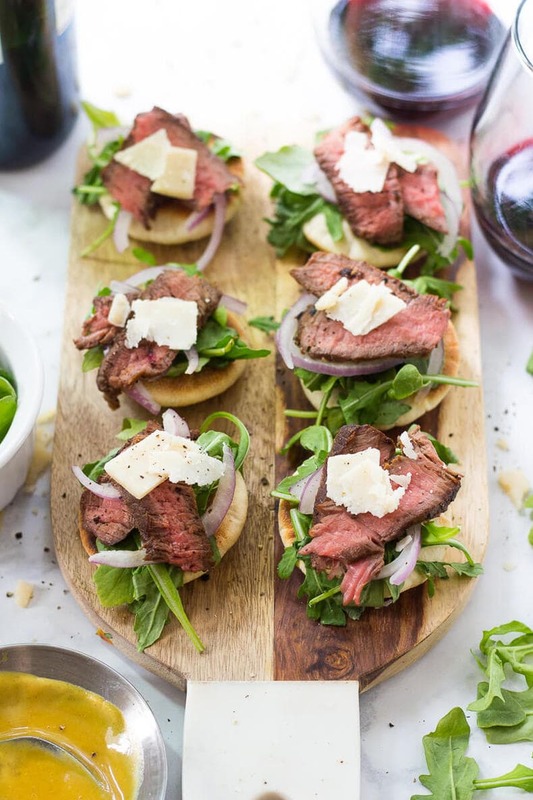 Summer sadness aside, will you be trying these Steak and Arugula Salad Bites with Parmesan?! 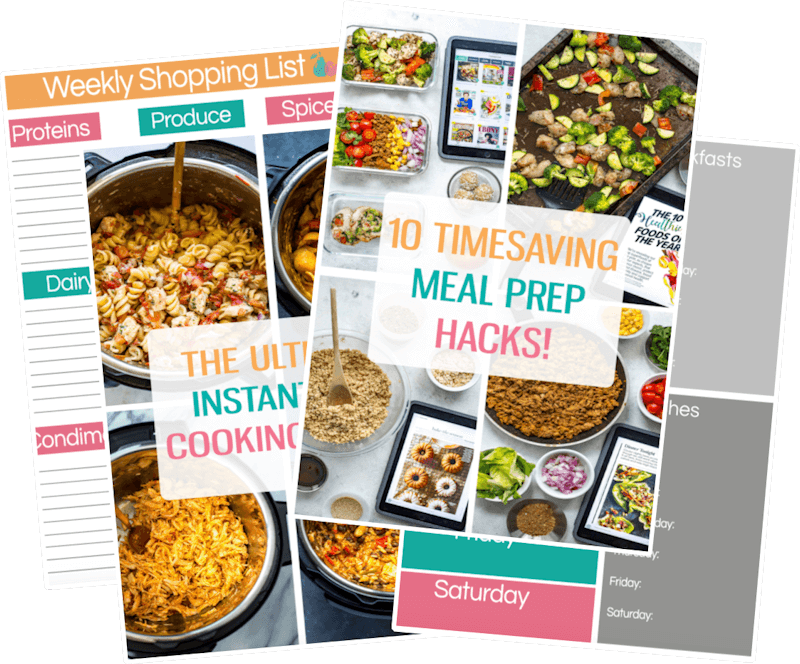 If you try any of my recipes be sure to let me know in the comments, on Instagram, Twitter or Facebook. I’d love to see what you’re grilling this year! 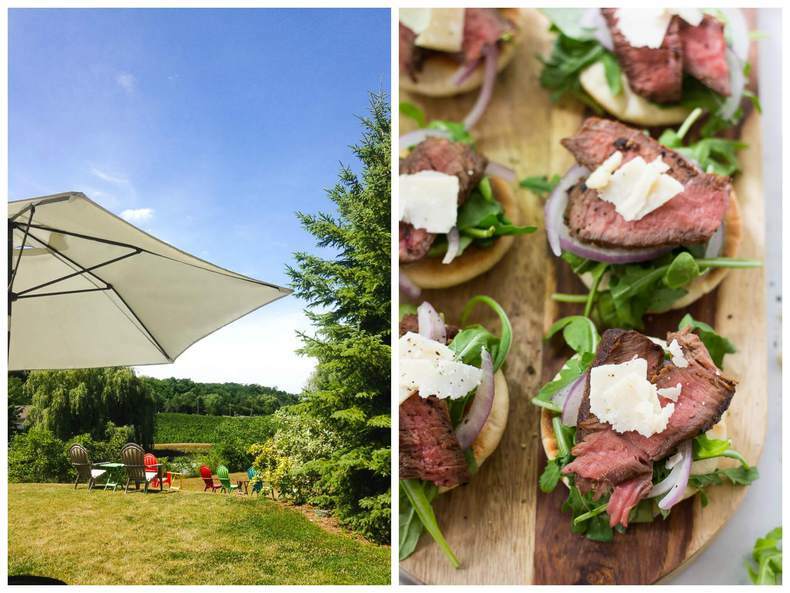 2 sirloin or rib eye steaks flank steak could work here too! Preheat grill to med-high heat. 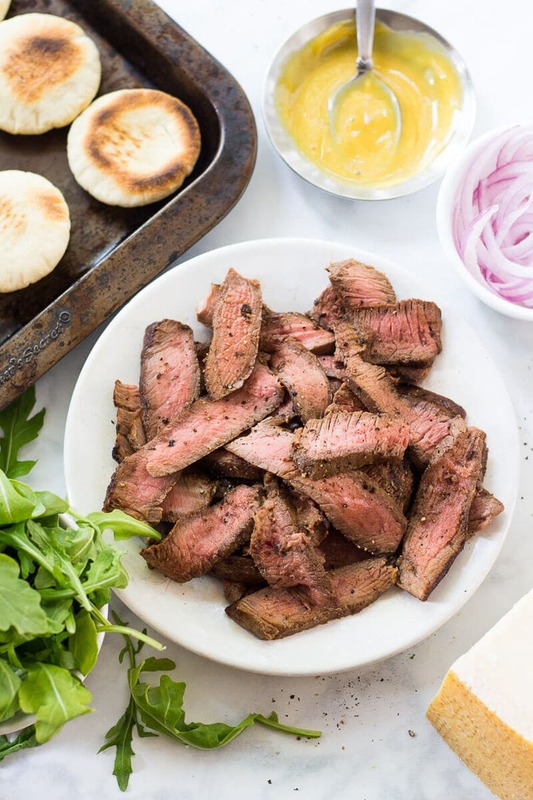 Brush steak with olive oil on both sides, then season with salt and pepper. Once grill is preheated, grill steak for 2-3 min on either side, depending on thickness of steak and the way you like yours cooked. Remove steak from grill and let rest for 5-10 min before slicing against the grain. Meanwhile, mix together honey dijon sauce. 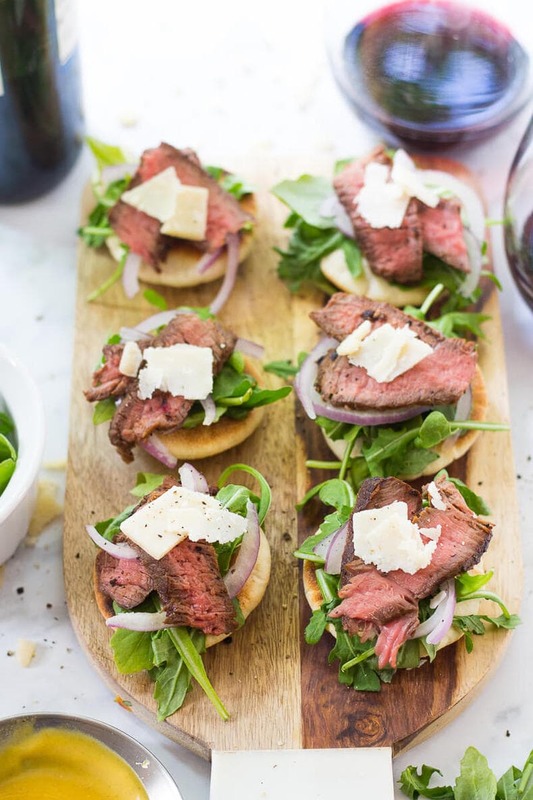 Toast mini pitas in oven ahead of time for 4-5 min if desired, then top each mini pita with honey dijon sauce, arugula, thinly sliced red onion, 2-3 steak slices then shaved parmesan cheese.